So, I’m at the North Market this morning with my sister, when I excuse myself to use the ladies room. When it’s time to wash my hands, I load up on the pink soap and place my hands under the faucet. “Oh. 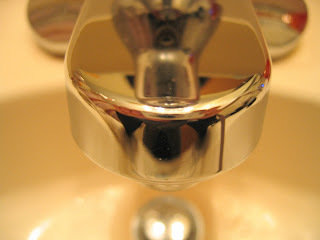 This is one of those sensing no-touch faucets – great.” I think to myself. I move my hands closer. Oh, of course, a little more to the right. Maybe I’m moving too quickly. Maybe my hands are too high. Oh wait, there obviously too low. Maybe I need to step back a moment before I lose my cool. What am I supposed to do with all this soap and no water to rinse it off? I turn around and notice the toilet’s got a lot of water in it – Groooooooss! Somebody told me once that the sensors can be thrown off by the color black. Of course, I thought that was ridiculous when I first heard it, but now as I stand here soapy and wearing black, I find myself wishing a lady in red would walk through the door. Right about now, my sister probably thought I fell in….. I walk away for a moment to regroup. I sneak up on the stubborn faucet, slide my hands under it, and BSHHHH! - a quick burst of water gushes out for just a second. If I would have blinked I would have missed it, but what I did get, was gonna have to be enough. Now, I go to dry my hands under the blow dryer. A sensing no-touch blow dryer. That is hilarious! Can't say that has ever happened to me...I can only imagine how stressful and funny that must have been, all at the same time.